BROWNSVILLE TN (April 19, 2018): You are invited to take a glimpse into the “Small World of Cotton” when Chester County native, Darryl Cox, brings his scratch-built cotton gin display and implements to the West Tennessee Delta Heritage Center (WTDHC). A reception honoring Cox will take place from 3-5 p.m., Saturday, April 28, when attendees are invited to meet Cox and learn more about his 1/16th scale creations. Cox, a building contractor by trade, collected farm toys for 18 years before deciding to try his hand at creating his own. His first attempt was in 2005 when he built a John Deere 220 center-fold Power-Flex disc like one his father owned. That was enough to spark a passion that led to a first place win at the National Farm Toy Show in Dyersville Iowa in 2008. The winning implement display will be on exhibit at the WTDHC April 28-May 23. Shifting his focus to cotton pickers and a gin that he remembered hauling to as a child, Cox set about building a large scale cotton display. The result won second place at the national show and has been featured at the National Toy Museum in Dyersville since 2014. This past March, Cox was invited to show the display at John Deere’s 100th anniversary celebration, Gathering of the Green, in Davenport, Iowa. In addition to the gin display, there will also be a scale hoist, used for weighing finished cotton bales, and other items from Cox’s collection added to the museum. The hoist display was originally shown at the West Tennessee Farm Toy Show, an annual event held in Jackson TN, and one Cox helps to organize. Not one to rest on his laurels, Cox continues to build farm toys from scratch and was awarded another first place win in February at the Gateway Mid-America Toy Show, St. Louis, Mo., for his original design of a John Deere Lawn and Garden dealership. 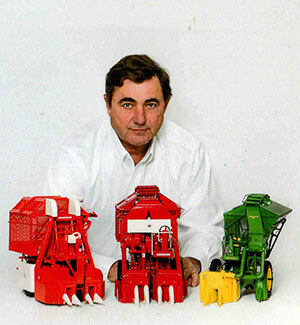 He has also been featured multiple times in Toy Farmer Magazine. (Photo): Darryl Cox builds farm toys from scratch. His models are 1/16th scale and will be on display at the West Tennessee Delta Heritage Center beginning April 28.